One of the distinguishing characteristics of a hedgehog is his quills. It is actually interesting to watch a hedgehog roll into a tight ball, and to see his quills stick up in every direction, all for the sake of protection. But, if you have a pet hedgehog, how can you handle him without getting injured by his quills? First note that a hedgehog’s quills are not as dangerous or as damaging as those of a porcupine. In fact, unless he feels threatened, his quills are actually quite soft. Do not think, however, that they won’t hurt if they poke you. So, the first objective is to make sure that you have a hedgehog that is well socialized, as well as a hedgehog that understands that you never mean him any harm. Start socialization at a very young age. First, socialization should begin with the breeder, and the hedgehog should be handled regularly starting when he is about two weeks old. Next, when you bring your new hedgehog home, make sure that you handle him a great deal. Always scoop him up…slowly and gently…by his underbelly, which will enable you to avoid being pricked by his quills. If he is in a ball, you will have to search for a spot to start smoothing back his quills. However, if the hedgehog is well socialized, and not being threatened, he will generally unroll from his ball on his own within a few minutes, and you can simply wait until he does to pick him up. Try to keep the same smell. Remember that hedgehogs have very poor eyesight, and he probably actually has no clue what you look like. Instead, he knows you by smell, and if you change soaps, shampoos, and perfumes, this can confuse him, and he may feel the need to get to know you all over again from scratch. 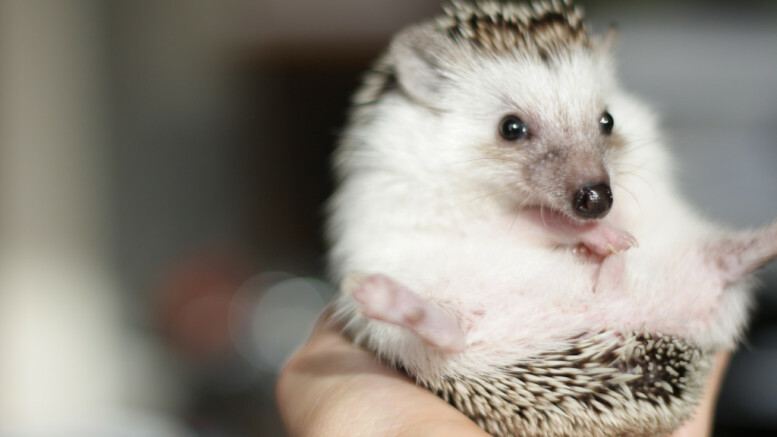 Try to avoid patting or petting your hedgehog’s quills if you can. They simply do not like this, and it can cause them stress. Instead, pick them up, and set them in your lap, and just let them sit there. As trust develops, he will actually start to enjoy petting, and will especially like gentle scratching between his quills. Don’t rush this, however. Some people acquaint picking up a hedgehog with picking up a pincushion with all of the pins turned in the opposite direction, but in reality, it really isn’t that bad. You should not wear gloves when handling your hedgehog. Instead, give him time to get to know you – your smell and the sound of your voice – and to associate you with friendliness. This can be accomplished by talking to him while feeding him small treats. Allow the hedgehog to sniff your hand before you attempt to pick him up. This is very important, especially if he doesn’t know you at all. He may even want to taste you, and this should not be painful for you. If it is, this may not be a hedgehog that you want at all. Use both hands when picking up your hedgehog, but do not allow them to meet in the middle of his belly. If he gets nervous and rolls into a ball, you will be in a fix…a painful one. 27 Comments on "Handling Your Pet Hedgehog"
it is SO hard to find hedgehogs these days and i don’t want to give up looking for them! i will not purchase one off of the internet. your tips are useful but now i guess i can’t use them. where can i get one and about how much do they cost? you will find al the info you need as well as findinhg your spikey friend. Great place to get an adopted hedgie is [email protected]. I just recently adopted one from the Texas seizure and he’s just adorable. Was recently given a Hedgie from one of my daughter’s teachers. Am looking for advise – her back is bald, and she has very dry, peely, itchy skin. What can I use to help her. Also, teacher mentioned he used small cat Revolution/Advantage on it for mites – I would think this would be harmful to a Hedgie. What can someone recommend for mites?? Advantage or Revolution for kittens is completely safe for hedgehogs. I have several (I’m a rescue) and we use it regularly. One or two drops and you’re done. Just be sure it is the kitten kind. Also, for maintenance after the mites are gone, Vitamin E is really helpful. Just poke a capsule and put it either in their food or directly on the hedgie. Some believe that putting it on the skin directly creates a barrier that prevents the mites from surviving. I would go ahead and treat with the Advantage first though. You’ll need to apply it once a month for three months and they should be gone and not come back. Hope that helps!! If you dont find one near you, look at places aroundd your area! Im sure youll find somthing! Hi I am getting a hedgehogs… once I earn enough:P I was wondering… A lady that I talked to said she couldnot pet her hedgehog’s quills and that he was always hissing at her and biting at her. How do I choose a good baby from breeder that will be very social? I just recently got a hedgehog when he was about 6 weeks old. I’m wondering about good ways to bond with him and have him be comfortable with me? He’s always trying to bite me, huffing and balling up whenever I try to pick him up. How much to hedgehogs generally cost? I am just starting my research on these pets. Does anyone know what kind of bedding this hedgehog was in??? hi, i have been looking into getting a hedgehog. I have 3 dogs, who sadly enjoy eating small animals. Will they hurt my hedge hog? I was also wondering if the cage should be glass or have bars. And this might be a stupid q but do there quils get stuck to stuff, or scratch it? Do you need to take hedgehogs to the vet? Would my hedge hog be ok if i took them outside of the cage when the dogs are outside? Can i bring my Hedgehog outside, or would it run away? Why do hegehogs die if they go into hibernation? If they go into hibernation is there anyway to wake them up?If anyone can answer these q it would be soooooo helpful!! P.S i am sorry for my ignorance about Hedghogs. Plz answer my qestions, i really want one!!! How come it doesnt hurt you when you touch your hedgehog? My hog’s quills are hard and sharp. I was wounded twice, it drew blood. Is there something m going wrong? I sometimes pick mine up with a towel to avoid getting poked. It helps! There is this breeder in Holmen, WI, she takes care of all her hedgies and also has a website, its about $150, but thats with a cage, wheel, some food, and a cage. hedgehogcentral.com in Ashland New Hampshire USA or granitestatehedgehogs.com been in business for many years, guarantee their hedgehogs, they do ship as well, check them out. I found mine on craigslist. He is a rescue. His mommy was going away to college and she wasn’t going to have the time for him. I paid 80$ for everything. Him, cage, wheel, food, bedding, the works. He’s good too.